Clashes have erupted at a hospital in Istanbul where a boy has died nine months after he was struck on the head by a tear-gas canister fired by police. In Ankara, police fired tear gas to disperse some 2,000 protesters. The boy, Berkin Elvan, 15, was wounded while on his way to buy bread in June. He had been in a coma ever since. His death is the eighth linked to last year’s mass anti-government protests, which began in Gezi Park, Istanbul, and then spread across Turkey. The boy’s family announced on Twitter that their son had died at 07:00 (05:00 GMT) on Tuesday. “We lost our son. May he rest in peace,” they wrote. He had been in a coma for 269 days and his health had deteriorated in recent weeks. Doctors said his weight had dropped to 16kg (35lb). Berkin Elvan was 14 when he was hit on the head by the tear-gas canister in the Istanbul district of Okmeydan. He was one of thousands of people hurt during last year’s protests. The protesters were initially angered by plans to raze Gezi Park and redevelop it, but the police crackdown galvanised anti-government demonstrators in several cities. Of the eight people whose deaths were related to the demonstrations, one was a police officer. After Berkin Elvan’s death was announced, his mother appeared outside Okmeydani hospital and was quickly surrounded by mourners. Tributes appeared on social media and hundreds of people gathered to show their anger. Riot police soon arrived at the scene and protesters attacked one of their vehicles. BBC Turkish correspondent Rengin Arslan said many in the crowd believed the police had not turned up at the hospital to ensure the safety of mourners but to make things worse. 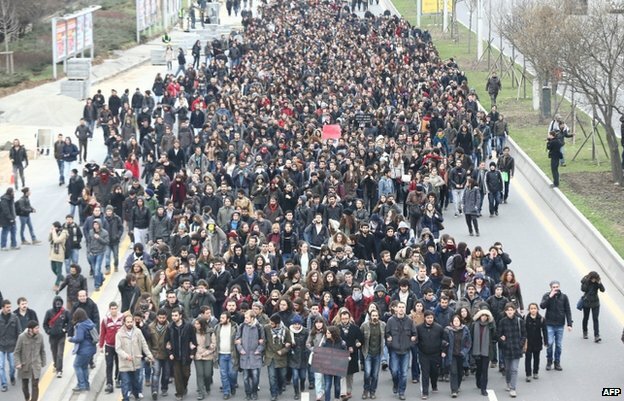 Further protests were reported in the coastal cities of Antalya and Izmir and in the capital, Ankara, where students boycotted classes and staged sit-ins. Larger demonstrations were due to take place later in Istanbul and Ankara. 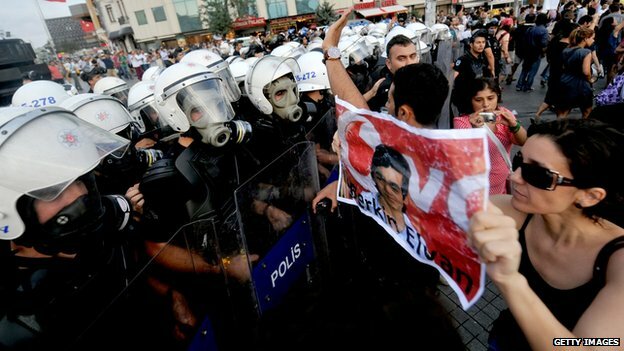 Berkin Elvan’s funeral is due to take place on Wednesday. Minute by minute the crowd outside the hospital grew and others said on Twitter they would come later after work. 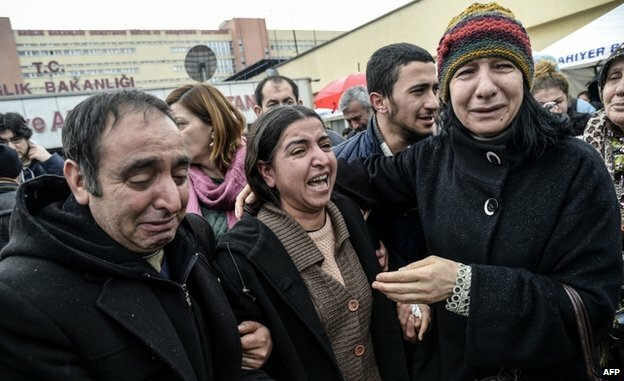 Berkin Elvan’s mother was crying and saying it was not God that had taken her son but the prime minister. The protesters grew angry in the belief that police were not there for their safety but to make things worse. Pepper spray was fired and there were reports that a man was hit in the face by a canister. As Berkin Elvan’s family and supporters left the hospital they headed for a nearby cemevi (prayer house), where the boy’s mother could be heard complaining she had been unable to protect her child. There has been no reaction from the government so far, but Istanbul governor Avni Mutlu has sent a message of condolence.